West End and Broadway leading man Julian Ovenden (Foyles War, Marguerite, The Forsyte Saga and soon to be Finding Neverland) and Laura Wright (Young Chorister of the Year) are performing on next weeks’ Friday Night Is Music Night's at the Chichester Festival Theatre. Ken Bruce hosts the evening on Friday 27th April at 8:00 pm which covers the music of Leonard Bernstein, William Tell, Andrew Lloyd Webber and John Williams. Ovenden and Wright are performing songs from their new albums including When I Loved You and The Rose accompanied by the 70 piece BBC Concert Orchestra conducted by Richard Balcombe. 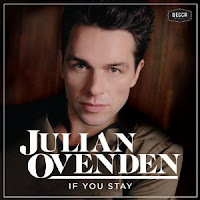 Julian Ovenden’s new album If You Stay is due for release on 23rd April and can pre pre-ordered from Amazon for £8.99 by clicking on the link.